“Because people don’t see me for who I am”. David was drawn to her story precisely because ‘she continually confounds expectations’ and he tells us, his readers, ‘ I want you to share the glorious surprise of seeing things from another side’. They met when they were both working for Circus Oz – he as the director, and she as a contortionist and juggler bouncing eight balls on a block of marble. Reading her life story, it is clear that these skills extend beyond the literal. Her journey as an artist from Addis Ababa to Australia involves plenty of shape changing and juggling of bureaucracies. She has this extraordinary driving energy that carries everyone, including David, along with her. and finally to Josephine Baker, the black American performer Hemingway described as the ‘most sensational woman anyone ever saw’ – which brings readers full circle, as it was hearing about Josephine Baker that inspired Sosi to create a new act for Circus Oz. While the book was being written, Sosina read drafts and David put ticks against the bits that she liked. He tells us “She likes it when I’m honest”. And I think this is what is so extraordinary about this book, because he is there with us all the time in the story, never shaping the action, but responding with an emotional and intellectual honesty that is breath-taking – particularly as he had no way of knowing when the project began that telling Sosi’s story would involve confronting the ‘power of grief and death’ that echoes from his earlier me-writing. … a question to which he can give no satisfactory answer. Yet in this story of Sosi, Young Victorian of the Year and nominee for the Australia Day Awards, told by this ‘pasty white boy’ from Perth, there is a challenge to the geography of power, which David, in one of his glorious metaphors, describes as: ‘the invisible fence that zigzags the world’. 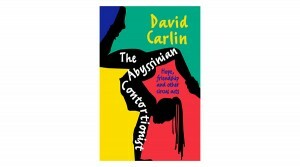 Before you buy the book and get it signed, please relax, and get comfortable, because David is going to read to us from The Abyssinian Contortionist. This entry was posted in Culture, Human Rights, Refugees and tagged Abyssinian Contortionist, David Carlin, Ethiopia, refugees, Sosina Wogayehu by Julie Holledge. Bookmark the permalink.